The new rules have nothing to do with current ranking, they are used only to reduce the allocation if equity is low. The calculation of the rating and ranking is always the same. At the moment UEI is very low because "regularity" percentage is low but we are at the beginning of the month so it will move to more decent values going forward. Activity has been renamed to Regularity. Ok, I guess I am too late to reply but I feel that I have to add my comment to this topic. It will be short and simple. I was always a proponent of traders inputing more of their own capital to show investors how dedicated they are to their own system, but here what I see is darwinex using it as an excuse to give less capital to top traders. So in a nutshell yes, trader's capital should be disclosed but only for investors' awareness not for the purpose of allocation reduction. I was silent, but here I am posting out cause I didn't pay attention to the exact wording that says "trader's equity" not balance, equity. What does equity has to do with it. If anything they should be looking at trader's balance. That is how much a trader is willing to put into the game. But when they calculate from equity, and not just equity but minimum equity, man, it tells me a lot. My resume is darwinex has decided to cut on investments and they found the way to do it. Not a good move if you ask me. My opinion only. Monthly allocation has increased from 4M to 4.5M, and qualifying Darwins have been increased from 40 to 60. So your accusation maybe a bit overstated. The truth iis always somewhere in the middle. It is unlikely that everyone in top 10 will have equity> 10k. That said, I have a significant amount of capital in my account and for some reason I seem to have been heavily penalised by the new rules - currently at 866 in Novembers DarwinIA contest. As @CavaliereVerde pointed out, nothing has changed in terms of rankings. Since we are only at the beginning of the month, users with a higher Activity / Regularity score are better ranked. This is normal at the beginning of the month. As days pass, everyone's regularity score tends to increase so Score and Return become the decisive factors. So in a nutshell yes, trader's capital should be disclosed but only for investors' awareness not for the purpose of allocation reduction. I have said the same in this post in another thread. Let traders trade the way they want and with how much they want, and let investors pick the strategies they prefer, given that freedom. The skin we have in the game is our reputation, track record, and losing out on future funds to manage. Then once they have either Darwinia or Investor Assets offered to them to manage, then give them the choice to Put up a certain realistic % of the total Assets they are managing as their own investment. After the allocation not Before. The regularity could just be included in the D Score, not as a separate component (and a heavily weighted component as many have surmised in the other thread about this topic). Those with higher D Scores (with Regularity added) would have proven that they should be more heavily advantaged in months when their Return is good. I do understand though that Darwinex does not want someone "getting lucky" on a small account in a short space of time, and pushing up their risk, just to win an allocation thru Darwinia when they really have not proven that they are able to manage risk and capture returns consistently. I just don't really think this would be a regular problem, but maybe I am wrong. 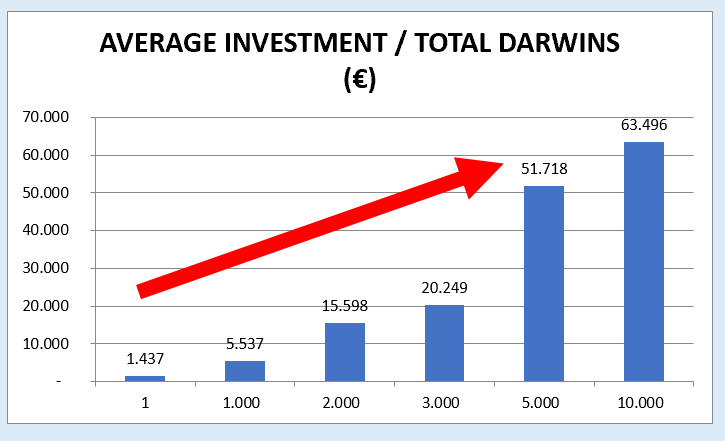 I do not know how other DARWIN's have performed with significant Darwinia Allocations or Investor Allocations. So maybe this is what the data are telling them. Managers need to have something to lose, yes. Managers need to show consistent positive trading behavior, yes. Seems like this should be something savvy investors can already ascertain from all the tools and statistics available here, but again, maybe I am mistaken. I have this image in my mind of managing 2 million dollars or more and just trading when the high probability trades present themselves - so like 5 days out of the month. Isn't this reality for some fund managers? That is it! Darwinex is free to allocate funds as it wants. I've decided not to participate in this debate and much has been said from different persons but I discovered smth that I find very negative. So darwinex decided to allocate darwinia prizes relative to minimum equity. You have to stronglyunderline these words because the devil is hiden there. Minimum equity mean that the prize is applied to the maximum DD in the month. So nobody can take the maximum prize even with the money required almost you have a 0 DD. Sorry I dont think so. You have 10K, you have an DD 5% that is 500 $. Somebody before mentioned he wishes to manage 2 million dollar investments. So tell me in relative terms, how is having a 1000 dollar traders equity (or what have you) vs 10 000 different in relation to 2 million? If you look at it from this angle there is almost no difference. Or soon they will claim that a trader should have a proportionately growing equity in relation to investors' capital. So it returns me to my previous thought that the new equity rules are put there as a leverage to decrease monthly allocations and done so that everybody would think it's in their own interest. But hey, it's darwinex's capital and they are free to invest the way they want. You are right, I think they want also to save money. The point is that traders have to get used to trade with a significant amount. Are 5k or 10k a "professional account" ? No, but probably they are significant and not expendable. the significant amount is one thing, allocating money in focntion to minnimum equity it's another. If your strategy can support an DD of 20% , you loose 20% allocation , even you recover the DD this isn't take into account. That's maybe not important for 10K but for smaller amounts is more negative. Yes. And also, I previously had a 60k+ trading account and I asked Darwinex to disclose trader's balances. I wanted people to see how much I am willing to risk of my own capital, but to this date all they did is put >10k. So how can a million or multimillion dollar investor make a decision to invest (not talking about darwinex but private whale investor) in a trader when he can only see from 0 to 10k+. Where is the logic here? Please answer me. So unfortunately my balance has come down since those times because I had to withdraw most of my funds. And in this situation what do I get? That's right - less allocation. So not good for me. And not particularly useful for private investors either. How do you know if a trader has a 10k account or a 1 mil account. So to have a max allocation a trader must have 50% plus that minimum required. Can anyone efford this? That is the question. Indeed, calculating from equity does not make any sense to me either. I have my balance, so if you want to know how much I am willing to trade with go with my minimum balance for this month or calculate from an average balance of this month. I am going to try to explain what is Darwinia in my opinion. Darwinia is a MARKETING tool, and all the marketing tools try to attract GOOD CLIENTS. It is true that a good client can be a good trader or not, and a good trader can be also a good client or not. What do I understand that are good clients for Darwinex or every company? A good client are those who create more incomes to the company, and mainly colaborate to pay the salaries, the invoices, all the costs, and why not to say, make profits to the company. Investors and traders come here to get profits, why not Darwinex have the right to look for profits to their shareholders? As clients we can ask for that these incomes and profits have to be aligned with our interests. In the case of Darwinex, it is difficult to find other bussiness with the interests more aligned. I see as an obligation, not only a right, to intervene to manage the company looking for their interest. That will be good not only for their shareholders, will be good for the employees, and all the traders and investors that have deposited a good amount of money here. Nothing to hide. But what are the way to make incomes for darwinex? Yes, the incomes are luckily only the COMMISIONS, and while you generate more incomes / commisions you will be considered better client. Then good clients could be traders or investors. With the investors is easier, they will be considered better clients while have more equity invested, because it will be directly proportional to the incomes/commisions generated. Considering dscore and % monthly return in Darwinia, not volume. 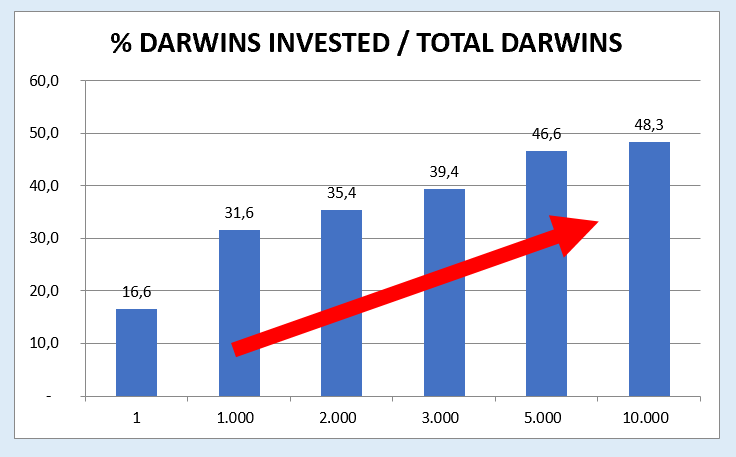 Even with the change of Darwinia, Darwinex it is not putting in a better situation to these type of good clients, they have the same improvement of 5 million and 12 position more than everybody. They have put only the same rules to everybody in terms of leverage from the equity, nobody loose their position. 2) By the other hand are the incomes/commisions that the trader generates with the investment attracted, those will be higher while the EQUITY of the investment in the trader. Here it is the case where a good trader could be a good client or not. They will be better clients, while more investment attract. 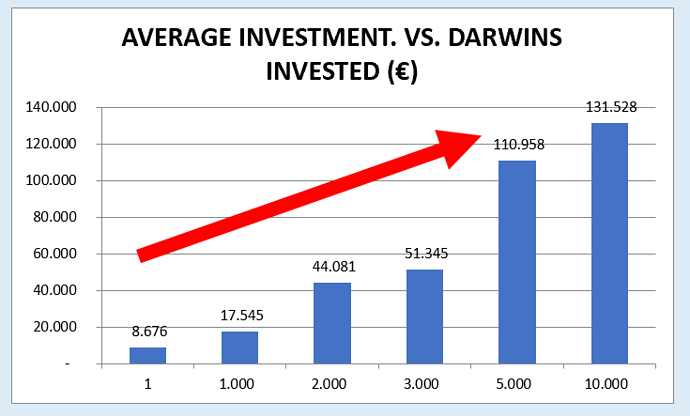 There were not anything in Darwinia and d-score related with equity, because I think that Darwinex really thought that everybody can become a good client in terms of investment. Maybe they thought, as I always thought, that if you have less equity will be more difficult to attract investors, but now everybody can see it if we carefully analyse the data that the transparency of darwinex let. In the next post I will attach some tables and charts that demostratre that is easier to receive investment while the equity is higher. It is not only the reliability of the market to grow with bigger investors today the investors consider the equity to invest more or less money, and good traders with higher equity, would receive more investment. Ah right, I had incorrectly put two and two together and come up with seven! In the next post I will attach some tables and charts that demostratre that is easier to receive investment while the equity is higher. Next chart it is the average of investment / total darwins of every frame, and the second the average of investment/darwins invested of every frame.